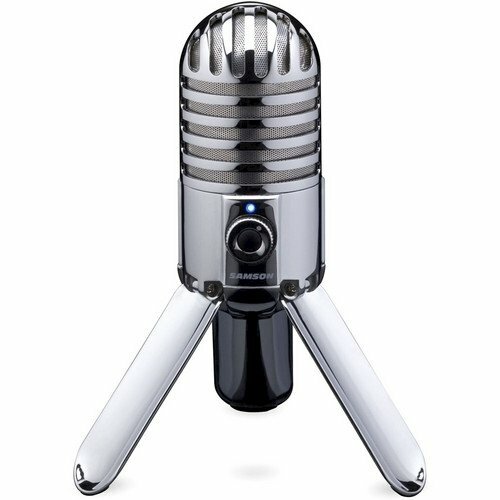 With its smooth, flat frequency response and CD-quality 16-bit, 44.1/48 kHz resolution, the Meteor Microphone's all-zinc, chrome-plated body and the fold-back legs are designed so it can sit on your desktop in the optimal position for any recording application. It also features a built-in mic-stand adapter for use with a boom or desktop mic stand. Furthermore, the Meteor Mic, when recording acoustic guitar, vocals or speech, has a stereo 1/8" headphone jack for zero-latency monitoring and a headphone volume control. In addition, a microphone mute switch grants you the luxury of immediate privacy while video conferencing. Start recording right out of the box with the Meteor Mic. There is no need for drivers because the mic can connect to any computer and is compatible with most computer-based digital audio workstations.